The Cathedral of Santiago, a universal sanctuary and pilgrimage destination, is a spacious and open door refuge. It embraces and welcomes the pilgrim, and encourages them to always keep a questing spirit in life. The ritual of embracing Santiago the Apostle upon arriving at the Cathedral symbolizes this fraternal sentiment of welcoming another. A pilgrimage is not just about the Way and walking through foreign lands towards a sanctuary, it is about becoming a better person each day you walk. Santiago the Great was one of Jesus' twelve disciples. A brother of John the Baptist, he was the son of Zebedee and Maria Salome. Along with Peter and John, he is part of the three privileged disciples that were admitted by Jesus to the most important moments of his life, such as his agony in the Garden of Gethsemane and the Transfiguration. 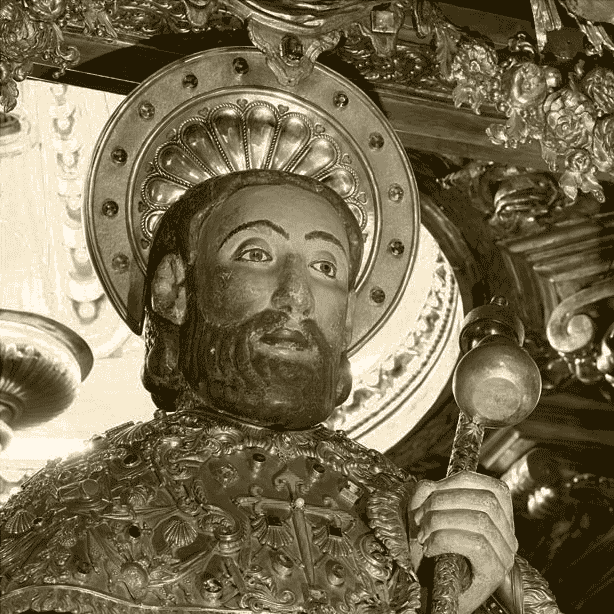 According to the Acts of the Apostles, Santiago was the first apostle to be martyred, his throat slit by order of Herod Agrippa around the year 43 in Jerusalem. According to tradition, his body was moved to Galician lands and was interred in a forest, where the Cathedral stands today. The Cathedral of Santiago welcomes any contributions or donations to keep the online candelabra alive. Contributions will be used to ensure the daily operation of the Cathedral and facilitate its character as an open space of prayer and cultural interest for everyone. Lighting a candle is completely free and it will remain lit for 48 hours. Share it so others keep it lit for longer. Learn all that you can from those who walk beside you.